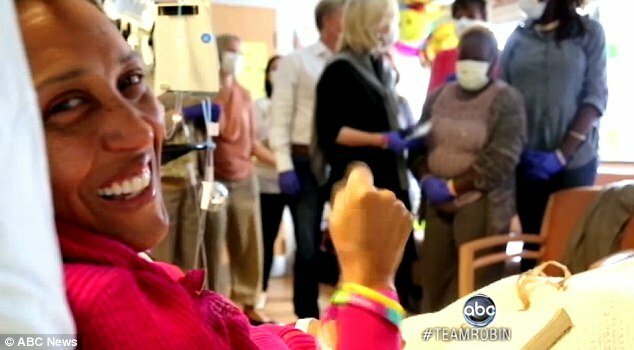 Good Morning America co-anchor Robin Roberts underwent her bone marrow transplant yesterday, surrounded by her closest friends and family. The procedure, which saw donor stem cells from her sister Sally Ann injected into her body, took just five minutes, after which the group broke into a rendition of Ain’t No Mountain High Enough. Robin Roberts, 51, who was diagnosed with myelodysplastic syndrome, or MDS, earlier this year – a disease which attacks blood cells and bone – told GMA afterwards: “I will now wait and anxiously watch and see what happens. The atmosphere beforehand was informal, with her sister by her side and a visit from her pastor to lead the group in prayer. ABC News co-workers Diane Sawyer and Sam Champion were among the intimate group present. Though it is expected to be at least ten days before Robin Roberts starts to feel any improvement, her doctors say that she is in good spirits and recovering well. The GMA host will be closely monitored by doctors over the next few days, as they wait to see if the new donor stem cells will take hold. It is also crucial that they protect Robin Roberts from any possible germs or infection, as her immune system has been wiped out in preparation for the new cells, and she is vulnerable until they take hold. Robin Roberts released a video to fans early yesterday morning, in which she thanked them for their love. She looked frail in the film, most likely recorded the day prior, after eight days of intensive chemotherapy. The treatment appeared to have taken its toll and Robin Roberts had clearly lost a significant amount of weight as she addressed the camera.